Daydream Toy Play With Your Food Princess and Animals Double Eating Set Just $13.00! Down From $29.99! 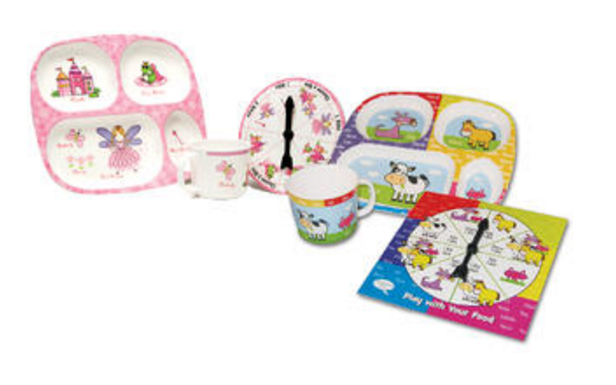 You are here: Home / Great Deals / Daydream Toy Play With Your Food Princess and Animals Double Eating Set Just $13.00! Down From $29.99! Sears has this Daydream Toy Play With Your Food Princess and Animals Double Eating Set on sale for $13.00 (Reg. $29.99)! Healthy eating can be child’s playÖeven for picky eaters! Once engaged in an entertaining meal, children won’t notice that they are actually eating food that is good for them! Just prepare a wholesome meal, place one type of food in each section of the plate, spin the spinner, & eat from the designated section. Sounds so simple…but children love it! And mom’s love Play with Your Food, too. This can truly change the dynamic at your dinner table and is a great way to encourage kids to try new foods. Set includes: 2 Princess and Animal melamine plates, 2 matching mugs, 2 spinners. Mug doubles as a great cereal holder. Plates and mug dishwasher safe. Not for use in the microwave. Spinner wipes clean. Made in Thailand. Ages 2+.